Owa of Ogbagi, Oba Victor Adetona, was on Friday chased away from his palace by the youth of the area for failing to approve the yearly celebration of the Ogun festival. The youth armed with dangerous weapons went on rampage destroying property in the palace and vandalizing cars. The monarch was accused of disrespecting the town’s tradition since he became the king of Ogbagi in Akoko South-West Local Government Area of Ondo State. One of the aggrieved youth who spoke with reporters said, “Our king has not been respecting our traditions. He has refused to join the Awo cult. He has refused to marry another wife after he became the king; and he has consistently refused to approve the celebration of some traditional festivities. 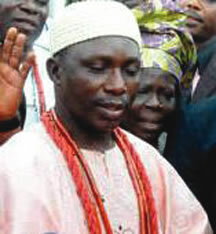 The king was reported to have traveled out of the state so as not to participate in the Ogun festival. His movement was tracked by the youth who stormed the palace as soon as they got wind of his return. At the palace gate, the monarch pasted the membership emblem of the Redeemed Christian Church of God while there is a place where members of his church congregate every Sunday evening for fellowship. When asked to speak on the attack, the monarch refused to comment saying “it is not yet time”.